1 How to close a Twitter Account ? 2 How to delete a Twitter Account ? How to delete a twitter account ? How to unsubscribe from Twitter ? What are the different steps to delete a Twitter account ? How to disable and delete my Twitter profile ? Delete-Account.net present you a detailed tutorial to understand how to delete a Twitter account and how to delete a Twitter profile permanently. Twitter is in decline for some time. For users of the first hour, we find that the social network has mutated and becomes close to Facebook (advertising system and functionalities are good examples). It is also possible that the 140 characters that made the identity of Twitter disappear soon (internet rumors at the time of writing this tutorial). You want to delete a Twitter account ? 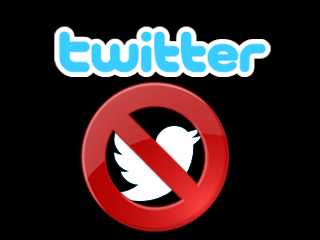 We will see in details how to remove a twitter account and how to unsubscribe from twitter permanently. How to close a Twitter Account ? Before deleting a Twitter account, it is important to know that you will lose all your information, data. If you delete your twitter account, your twitter username will also become available and it will can be used by another user. To unsubscribe from Twitter, the procedure is not complicated and you only need a few minutes to close a twitter account. If you have correctly followed the steps you have deleted a twitter account. How to delete a Twitter Account ? Unsubscribe Twitter and close his Twitter account is very easy and could be done really quickly. Log in to your twitter using your email login and password. If you had forgot your Twitter password you can get it by clicking on “forget password”. 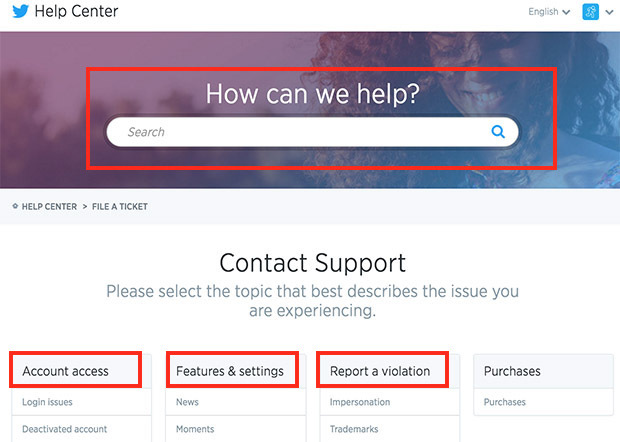 If you have other trouble or connexion problem, you can go directly to the Twitter help center (we are talking about it in the end of this post). You can also log in with your username using the @ or using your phone number if you had associate this one with your Twitter account. 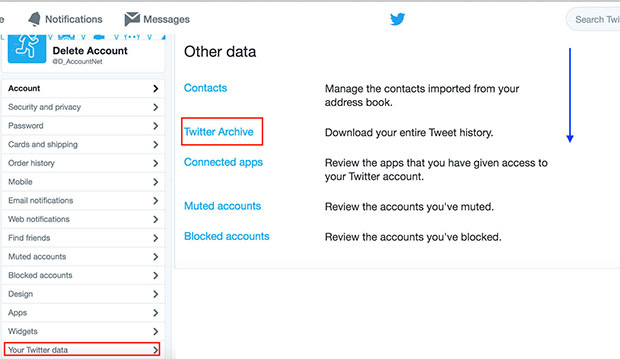 If you want to recover your files before deleting your Twitter account, you can do it through your settings. Click on the top on your profile picture then click on “settings”. 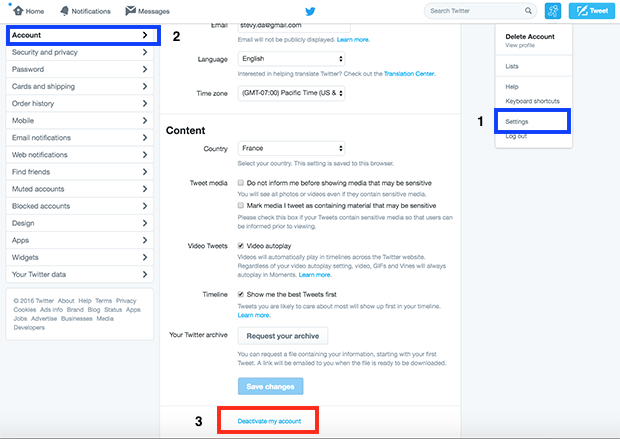 Once in the settings section click on “your twitter data” and scroll down page to access the link to download your Twitter archive. In the settings section, click on the link “your Twitter data”. You will find a link to download your entire Tweet history. To delete a Twitter account, you can go to your settings and click directly on the link to delete a twitter profile. Go to your settings (click on the top on your picture profile and click on “settings”). When you are in the settings section, select the link “Account” on the left menu, scroll in the bottom of the page and you will find the link to deactivate your Twitter account. Click on it to delete your Twitter account. If you deactivate your Twitter account, all your content will be deleted and your twitter account will be lost for ever. When you will click on “deactivate my account” a new window will open and you will have to enter your password to confirm your deletion. If you need a special help your can use the Twitter Help Center. You can access directly to the Twitter help center by clicking on this link : contact Twitter . When you will arrive to the Twitter Help Center, you will have a search bar that you can use directly. You can type some keyword on the search bar to find a quick answer to your question or you look on the different categories to find the part where you can solve your problem. 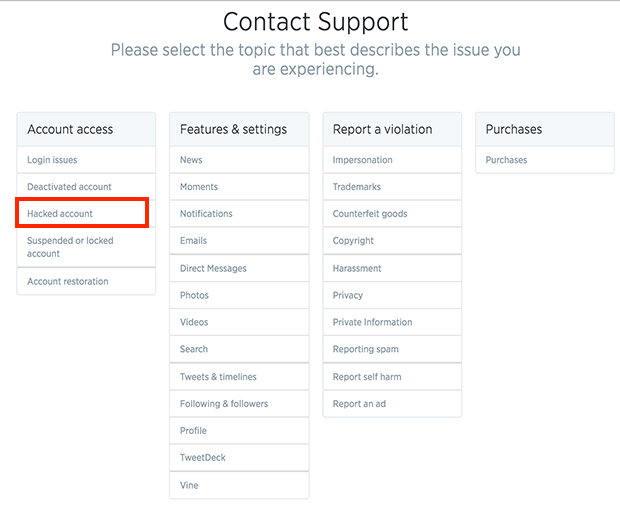 If you have a connexion problem, you will probably find a solution in the section “Account Access”. If you want to report a problem or an abuse, you will find a way in the section “report a violation”. If your Twitter account has been hacked , you can report it via the Help Center. You will have to click on the link “hacked account” in the section “Account Access”. Follow the instructions in order to regain access to your account. When you can log into your account again , be sure to secure your account with a stronger password . Generally, an account which is hacked, is hacked because the password wasn’t good enough.Putting numbers and special characters in the password you will maximize the security of the password.